My Review: When Al finds himself in the wrong place at the wrong time, his fortune suddenly changes. From living on the cold streets to living it up in Florida, Al is about to hit it big. He enlists the help of his new friend, Howard, but will he regret it? Kurt has hit rock bottom in the past, but he's on his way to living a respectable and meaningful life. He's made a choice to do the right thing, but will his new philosophy get him in trouble? When he meets Candy, a woman on a mission to discover her late boyfriend's secrets, Kurt finds himself caught up in a situation that quickly spirals out of control. I thoroughly enjoyed this book. 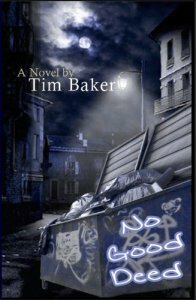 From the fast-paced plot to the well-drawn characters, No Good Deed was a book that kept my interest. In Al, Kurt, and Candy, the author has given us characters we can root for. Though most of us have never shared their experiences or faced the challenges they're facing, the author has made them easy to relate to. The plot was tight, without a single hole I could find, and it's obvious the author really did his research with this book. I'd recommend it to anyone.